It’s all fun and games till a bird poops on you. Hubby and I are in Phoenix!! Goodbye rainy Portland days, hello sweltering Phoenix days… this is better, right? Anywho, the move down was quite an adventure as Hubby and I decided to drive it… nonstop… all 1,350 miles… ya. So I was in the car with CIA Cat and Hubby was in the Uhaul with Orko. We couldn’t have them in the same vehicle together as I’m pretty sure that’s how Word War III will start. It was all going pretty well, and since I was Red Bulling it, I never got tired, I also was seeing all the colors of the rainbow and I having a really interesting conversation with Barnabas, the purple unicorn in my back seat, when Hubby called requesting a potty break. Me: Roger roger good buddy, that’s an OK for a stop to flow the river, OVER! Hubby:… Babe we’re on phones, there’s no reason for CB talk. Me: Say again Tony the Tiger didn’t read your original shout out, OVER! Hubby: okay I have to admit I like Tony the Tiger. Me: Sweet! Call me Goddess Fantastico! So Hubby and I stopped at a rest station and I was kicking back with Barnabas enjoying my 20th Red Bull when I heard a strange squeaking noise followed by someone screaming my name. 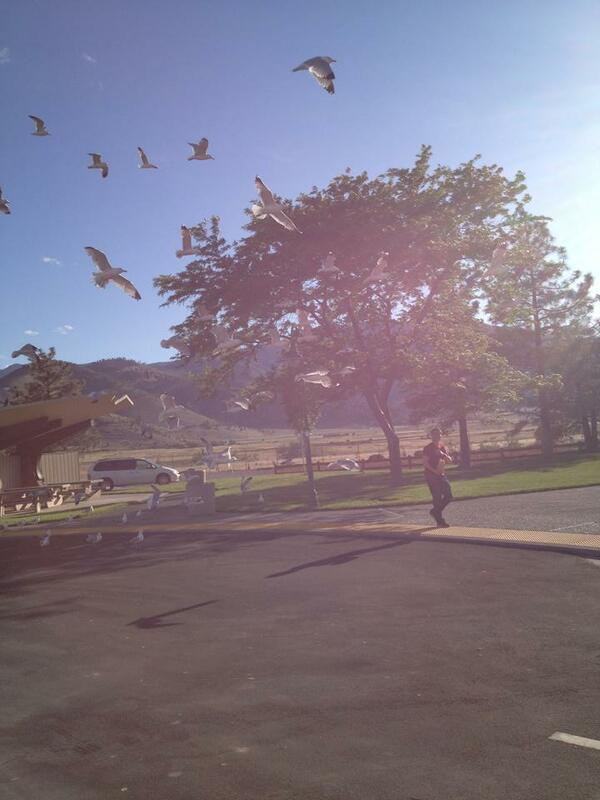 I looked over to see Hubby running towards the car with a flock of seagulls dive bombing him from all sides. Hubby: I GAVE ONE A FRY AND SUDDENLY HE HAD LIKE A HUNDRED FRIENDS!! OPEN THE DOOR!! Me: WHAT IF THEY GET IN THE CAR!?! Hubby: OPEN THE DOOR BEFORE I GET AN EYE PECKED OUT OR POOPED ON!!! Me: I FIND IT INTERESTING YOU PUT MORE EMPHASIS ON THE POOPING THEN THE LOSS OF AN EYE! Me: OPEN THE DOOR… WHO??? Hubby:… YOU ARE FREAKING KIDDING ME!! This entry was posted in Humor and tagged Animals, birds, car trip, cat, cb, dog, funny, laugh, life, love, marriage, moving, traveling. Bookmark the permalink. 3 Responses to It’s all fun and games till a bird poops on you. That. Is. Awesome. Doesn’t he know better than to feed the searats? You never feed the seagulls! Never feed the seagulls! It’s that movie “The Birds” – they work for fries! They are worse than goats at a petting zoo. really funny – reminds me of a long distance hurricane evacuation pets and all. AWESOME and you got photographic evidence! Way to be on top of it after all that red bull!